The Fluke 985 particle counter is an essential tool in the facility maintenance, HVAC and IAQ professional’s toolbox. From filter testing to indoor air quality investigations, the particle counter equips the user with valuable data concerning the concentration and source of particulates in the tested environment. The new Fluke 985 Particle Counter is ideal for troubleshooting and monitoring indoor air quality issues and verifying HVAC filter performance and critical locations for ISO Class 5–9 certification. 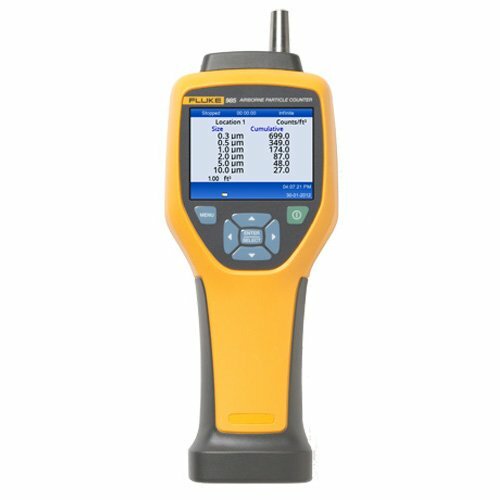 With the ultra-light weight ergonomic design, easy to view color screen with intuitive icons, on-screen trend graphs for easy and quick analysis, the Fluke 985 is a must for any maintenance, HVAC and IAQ professional.